We are so happy to have Satu from Indie By Heart visiting our little blog today. Satu is one of the sweetest ladies you could ever have the pleasure of getting to know. Make sure you stop by and visit her lovely blog. We cannot wait to try the delicious looking Mango Cheesecake recipe she is sharing with us today. Hello all, I'm Satu - guest blogger of the day at Sunny Days & Starry Nights. I'm from Finland (yep that's where Santa lives! ), work at jewelry shop and live with my boyfriend. My blog Indie By Heart is mostly about my inspiration, shopping, outfits, favorite stuff (music, movies, TV) and food! We try to cook together as often as possible - but mostly it has been my job around the house. It doesn't matter, since I really love cooking! I also love to bake small treats, and by reading this blog I know that Jessica & Tracy do too. So that's how I came up with the idea for this post, and decided to show you one of my best achievements yet: Mango Cheesecake. I found it online when searching for something simple to do (and without the oven for a change), changed it a bit according to what I found in the kitchen and tried my best. Everyone loved it, when I took the cake to our summer cottage last Midsummer. So much, that there was nothing left after couple days! Now it’s your turn to try, I hope you like it. Grind the cookies with any tool or machine you have at home. I used mechanical grinder myself. 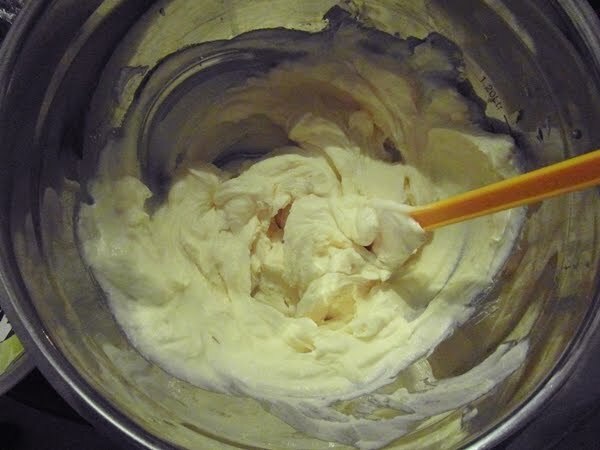 Now melt the butter: over stove in a pot with as low temperature as possible (to avoid splatter) or if you choose to use the microwave's melt option, use plastic dish. Add thin chocolate bites into the hot butter and let them melt in it. Combine the cookies and butter in a bowl. 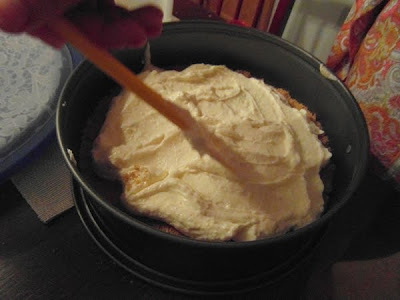 Put round greaseproof baking paper on the bottom of a cake mold, that opens from the side. Pour the dough over it, and press evenly. 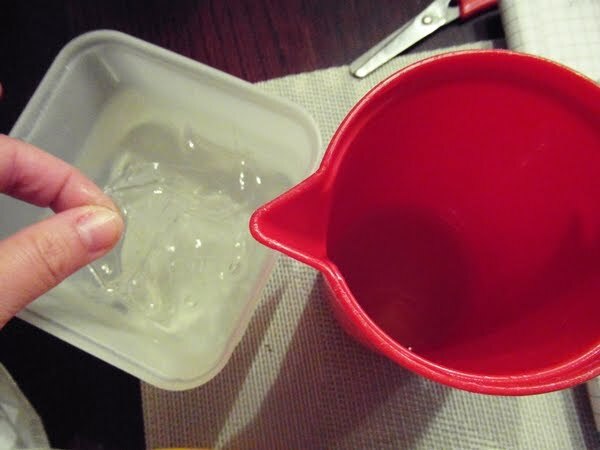 Put the gelatin leaves to soak in cool water until they’re soft. Mix cheese and vanilla sauce together. 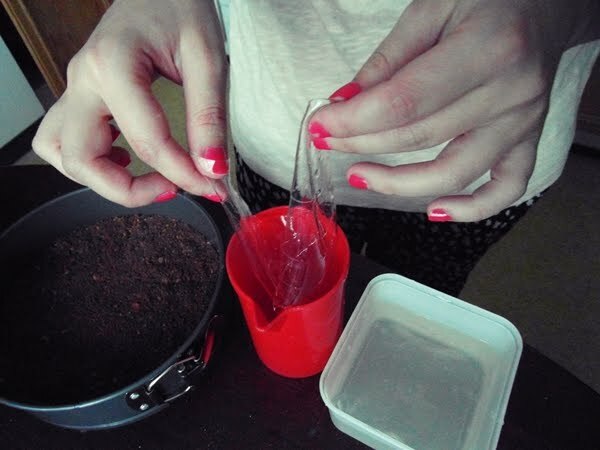 Place the softened gelatin leaves into hot liquid (0,5dl) one by one. Once they’ve melted in, pour the water and gelatin mixture into the cheese mix, as a thin string. 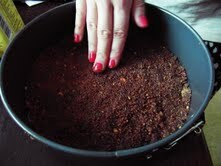 Pour this filling on top of the cookie base and let it set in the fridge for few hours, preferably overnight. Then you can make the coating! 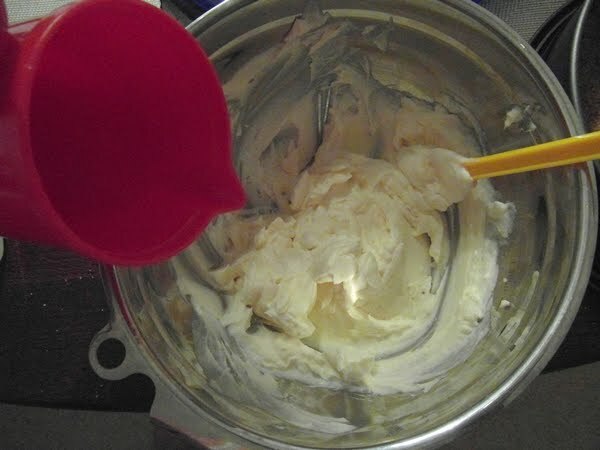 If you want the coating to be thicker, double the amounts. Pour mango sauce into a dish. Put the gelatin leaves to soak in cool water until they’re soft. Then add them to hot liquid one by one, and when melted in pour as a thing string to mango sauce. Mix together slightly. Pour the mixture on top of the cake and let set in the fridge for at least couple hours. You can speed up the process by putting it into the freezer. i love it!! !will pin it and try it asap!! nie to meet you! thanks for sharing and off to your blog now. wow .. i love this! Thanks girls ! x I told about this in my newest post too. OH.MY.GOSH. This seriously looks and sounds super heavenly!!! I just want to lick the screen right now. This looks like a fun and tasty recipe to try! Deeelicious!! Mmm I love mango and I love cheesecake - win win! I'll take a slice of that please.....and it's only 730 on the a.m. Girl I just bookmarked this amazing recipe and thank you so much for sharing. I'm definitely trying this out.